Here is your chance to own the first built in the conventional gear line of the popular P92 series of aircraft, to commemorate the 20th anniversary of the first P92 aircraft. In support of AOPA Foundation Inc., Tecnam has donated the right to purchase, at a substantial discount, the brand new Tecnam P92-TD Taildragger LSA, S/N 1413, N235TA. 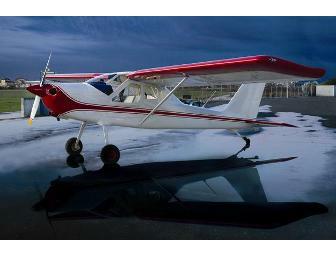 During our auction, the bidder is bidding on the right to purchase this Tecnam at a discounted price. The value of the difference between the final winning bid and the discounted cost of the basic aircraft will be donated to AOPA Foundation Inc. This aircraft brings a classic touch to a modern design, featuring a classically styled paint scheme, interior, instrument panel, and side-by-side seating, reminiscent of the old Cessna 140. *Flight time on the aircraft is original test flights, transit to and from EAA AirVenture at Oshkosh, limited demos, and flight to California. This aircraft is the first P92 in the TD series built. 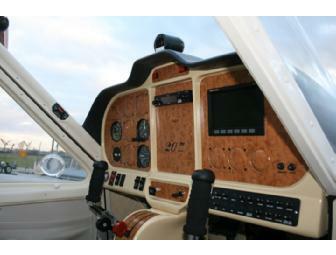 The images shown are the factory images of this aircraft, prior to the final instrument panel installation. Your support matters, so AOPA Foundation would like to use your information to keep in touch about things that may matter to you. If you choose to hear from AOPA Foundation, we may contact you in the future about our ongoing efforts.